My first culinary creation was a cheesecake. The primary ingredient in cheesecake is cream cheese. There is evidence that cream cheese was made as far back as the Renaissance. When Marco Polo returned from his travels, he reported that the Mongols simply left skimmed milk out in the sun to dry or that buttermilk or skimmed milk was reduced by boiling and made into a cheese, a procedure still in use today. Both cream cheese and aged cheese were widely used by pastry cooks throughout the classic period, particularly when made from full cream milk or milk where very little of the cream had been skimmed off. There are many recipes of this kind: Russian pashka, English and American cheesecake, Corsican cacavellu, fidone and chechiole, and the true cassata of Sicily. A drained cream cheese called turos was used by the Ancient Greeks nearly 3000 years ago and was considered fit for athletes in the Olympics; this cheese is called tiri by their modern descendants. The Romans also ate cream cheese prepared in the Greek fashion. In the late nineteenth century, two New York dairy farmers developed a rich cheese, perhaps inspired by the French Neufchatel. This new high-fat cheese was developed for the Empire Cheese Company, and later became known as Philadelphia Brand Cream Cheese. I'll begin with a very basic cheesecake. 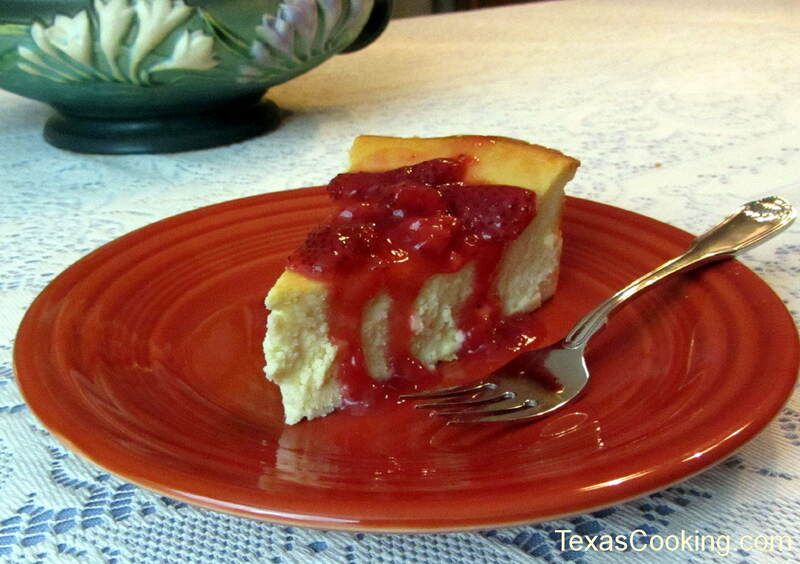 Cheesecake is versatile and can be topped with virtually any fruit, chocolate, berry or other dairy or cheese topping. A very classic topping is a sour cream topping. Since I can never make up my mind as to which topping I like best, I try to let the seasons decide for me, choosing whatever berry or fruit is at its perfection at that time. Chocolate, of course, is perfect all the time creating a never-ending dilemma for me. Mix all ingredients and press into a spring form pan, bringing crust most of the way up the sides of the pan. Follow the same directions as above. Crust may be partially baked ahead of time, but this is optional. If you bake it for 10 to 15 minutes (at 350 degrees F), it will be a little firmer and slightly browned. If you do not, it will be softer. It is just your preference, and you will figure out which way you prefer it. Another option is to chill the crust in the refrigerator while you prepare the cheesecake. Always let you ingredients come to room temperature before beginning. With an electric mixer, combine the cream cheese and sugar at slow to medium speed, scraping sides often. Add all other ingredients except eggs. When completely mixed (with no lumps), add the eggs and egg yolk, one at a time, beating very slowly. When eggs are incorporated, do not mix any more. Over-mixing the eggs is a contributing cause of cracked cheesecakes. (The leading cause of cracking is over-cooking, so dont believe any one who tells you it is normal for a cheesecake to be cracked; it isnt.) Always treat the batter gently. Pour the mixture into the crust-lined pan. Place the pan on a very large piece of aluminum foil, and fold the foil up around the pan to create a watertight barrier around the cheesecake. Then place the barrier pan in an even larger pan and fill the larger pan halfway with water. This is called a water bath. It is a gentler way to cook the cheesecake. Place the entire water bath containing the cheesecake in a 300-degree preheated oven. Cook for 1 hour and reduce heat to 200 degrees for 1 more hour. Turn oven off and leave cheesecake in until the oven is completely cool. The cheesecake can even be left overnight at this point. Your cheesecake should be slightly golden across the top. Cracks can also occur when a cheesecake cools too quickly. It may be beneficial to run a knife around the edge of the cheesecake, separating it from the sides of the pan. After removing the cheesecake from the oven, run a dull knife (a butter knife works well) around the edge to separate the crust from the pan, if you did not do so earlier. Ideally, cheesecake should be served on the pan in which it was cooked. A nice garnish will hide the bottom of the spring form pan and it can be placed on top of a very nice serving dish. If your goal is to serve the cheesecake on a different dish without the bottom of the spring form pan, then the pan can be lined with parchment paper before the crust is pressed in. This will make for easy removal of the cheesecake later. It works best if the cheesecake has been refrigerated fully before trying to remove it from the bottom pan. After the cheesecake has been chilled thoroughly, it is ready to be topped and served. The range of possibilities for toppings is so great that I couldnt begin to list them all. I will keep it simple by suggesting a sour cream topping, a berry topping or chocolate. Canned pie filling works quite nicely, too. Mix and spread over cheesecake. Very delicate and pleasant. Feel free to adjust the sugar or vanilla to suit your tastes. Put the chocolate chips in a food processor and pulse for a moment or two. Slowly add the hot cream as you puree the chocolate. When it reaches a smooth creamy consistency, it is done. Use your judgment. If you do not want to use all the cream, that is fine. It will just be thicker. Pour or spread the mixture over the cheesecake and let cool. It can then be decorated with fresh raspberries, other fruit or even nuts. For fruit toppings, always use what is in season for the best flavor. Frozen berries do not always look as pretty, but they taste good. The canned fruits seem to taste fine and look nice as well. You can leave the berries whole, but if the strawberries, for instance, are large, that may present a problem when cutting the cheesecake. Thinly sliced kiwi is a nice touch, as well as raspberries, cherries or blueberries. Most berries and fruits can also be cooked on top of the stove with a half-cup or so of sugar until they turn into a nice glaze. Variations on cheesecake might include substituting brown sugar for the granulated sugar and adding some chopped pecans and 1/2 cup Dark Karo syrup. I call this a Caramel Pecan cheesecake. You can add a package of melted chocolate chips (as always, for best results use a higher-quality chocolate). Or try white chocolate for a unique twist. Experiment by adding a few teaspoons of mint extract and creme de menthe to a chocolate cheesecake, and instead of graham crackers for the crust, use a finely chopped mint chocolate cookie. For a mocha cheesecake, add 1 to 2 teaspoons of instant coffee and 1/2 cup melted chocolate, while also adding 2 tablespoons unsweetened cocoa powder to the crust. In a bowl, stir together the ingredients and press crumb mixture evenly on the bottom and up the sides of a spring form pan. Set aside. Combine the cream cheese, sugar and cornstarch, and beat until smooth. Beat in the chocolate, peanut butter and vanilla. Add the eggs, one at a time, beating slowly but thoroughly. Fold in the peanuts. Pour mixture over the crust, and bake in a water bath at 350 degrees F for 15 minutes. Turn down the oven to 225 degrees F and cook for an additional 1 hour and 10 minutes. Run a dull knife around the inside edge of the pan and return to the oven. Turn oven off, and let sit until one is cool. Chill, uncovered, overnight. In a small saucepan, melt the white chocolate and peanut butter over low heat. Watch closely and stir constantly. Cool to lukewarm and pour over the cheesecake, smoothing the surface. Drizzle thin, parallel lines of melted chocolate over the white chocolate top of the cheesecake. Using a knife tip or a toothpick, draw lines gently across the drizzled lines. Chill until ready to serve. Remember: Your cheesecake will be done when the center looks firm. If the surface has a wet or shiny look to it, leave it in a little longer. Longer, slower cooking is always best. Always be sure the cheesecake has reached room temperature before refrigerating, and refrigerate before adding any topping. Making your cheesecake a day ahead of time will allow the flavors to ripen and improve taste. Cheesecakes freeze beautifully, so don't be afraid to freeze yours. Bring out the crunchy goodness of nuts by toasting them for 8 to 10 minutes at 350 degrees F. Grate fresh coconut or chocolate. If you have a pastry bag, you can pipe sweetened whipped cream around the sides of the cheesecake, and press nuts, coconut or chocolate into the sides of the cake. Being a Texan, one of my favorite combinations is 4 shredded carrots, 1 tablespoon cornstarch, and 2 seeded and shredded jalapeños, added to the basic cheesecake. It may sound strange but it is good. The bottom line is don't be afraid to experiment while keeping in mind the basic rules. Inventing your own recipes and masterpieces can be very rewarding and fun.